Patna, Oct 28 (IANS) Railway stations and airports in Bihar witnessed heavy rush of passengers, with people heading back to their places of work outside the state, with the Chhath festival having concluded. Patna airport saw professionals and skilled migrant workers hurrying to return to their work places, including Delhi, Mumbai, Chennai, Bengaluru. The Chhath rush also pushed up air fares to three times that on normal days for Saturday and Sunday, an official at the airport said. The air fare on Saturday from Patna to Delhi was between Rs 11,000-12,000 by Jet Airways and IndiGo, while by Air India it was Rs 20,000. For Sunday, the Patna-Delhi air fare is over Rs 13,000. The normal air fare is around Rs 4,000. 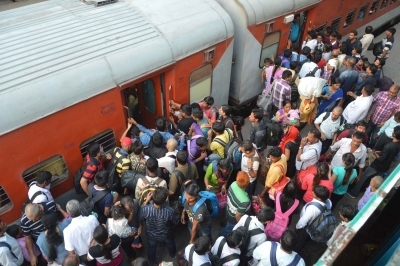 The fares were similarly very high for Bengaluru, Mumbai and Chennai due to high demand after Chhath. The fares are expected to normalise by November 3. The railway stations too witnessed a heavy rush of passengers, mostly migrant labourers, eager to get back to their work places. There is no berth available for reservation in trains going to Delhi and other places till the first week of November. 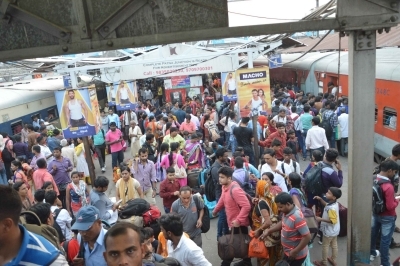 East Central Railway (ECR) official Rajesh Kumar said all the trains from Bihar are packed with thousands of migrant workers who are returning to their places of work outside the state after celebrating the popular festival of Chhath. He said that ECR is running 50 pairs of festival special trains to clear the rush. “We are also attaching extra coaches for passengers in long distance trains,” he added. 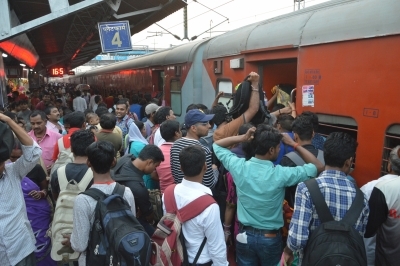 According to reports, hundreds of migrant workers are waiting at railway stations across Bihar to board long distance trains to their places of work. The four-day Chhath festival ended on Friday. More than three million migrant workers from across India arrived in the state last week to celebrate Chhath. Some had arrived before Diwali. “We will board an express train to Chennai,” Mukul Singh, who was waiting at the Patna railway station, said. Singh, who works in a factory near Chennai in Tamil Nadu, had come to his native village near Hajipur in Vaishali district to celebrate Chhath.